Who doesn’t love a good zoo? As a mom of three small boys, I am constantly having the talk about what can be a good pet and what really should be left outside in the wild of our backyard. That’s why having the Utica Zoo to fuel their sense of wonder and educate their wild side just an hour and fifteen minutes away is so great. Depending on where you are coming from in the Capital Region, you can expect the trip to take anywhere from an hour to two hours or so. The stretch of the Thruway, west of Schenectady is pretty as it winds parallel to the Mohawk River. You pass by some of Leatherstocking’s great cities and towns made famous by the Erie Canal. The Mohawk Valley Welcome Center, between exits 28 and 29, offers a lovely place to use the restroom and for the kids to run around for a bit before finishing off the last half hour of the drive. I love this stop since there are no fast food distractions and there is a play area that is safe and fenced in. Exit 31 brings you to Route 5S, which winds along Genesee Street south through downtown Utica. Make sure to follow the signs and follow the online directions. Expect to be on the road for about 15 minutes once you get off the Thruway but as soon as you enter Roscoe-Conkling Park, you will see the large sign welcoming you to the Zoo. Reading the sign sent my five-year-old hooting and squealing with excitement. 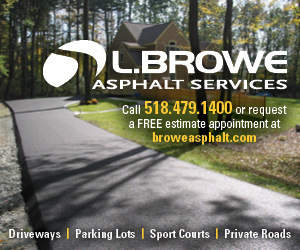 There are two large lots offering ample free parking that are steps from the gate of the zoo. Of course, getting your children to stay put while you organize your things will be difficult to do. 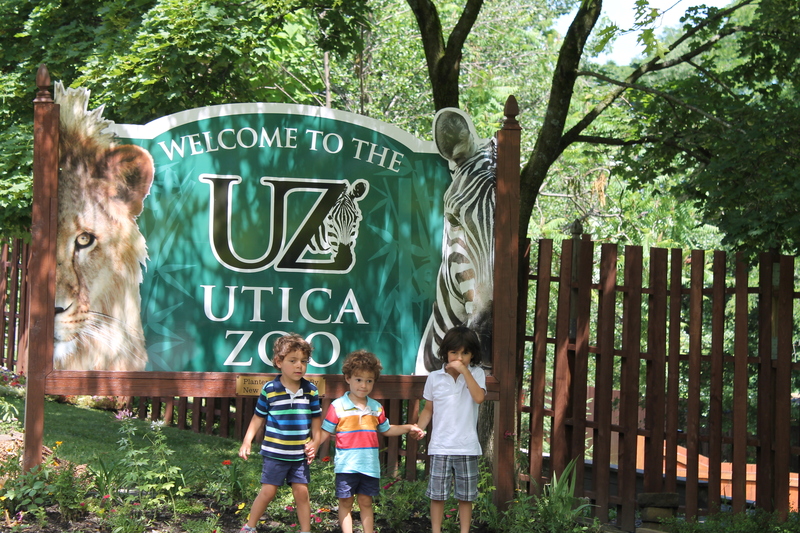 The Utica Zoo was founded in 1914 and is situated on 80 acres of the Roscoe-Conkling Park. Only half of the allocated land is currently developed and there are major plans to continue to grow and improve the zoo. On the day we went, there were a few exhibits that were closed because of construction and improvements that are being made. We could not see the primates due to their getting a new home (anticipated opening Fall 2018). The boys loved seeing the Burmese Pythons in their temporary home while their permanent home was getting a facelift and the Sea Lion tank was being cleaned as it is every Tuesday. The zoo is currently in the process going through a voluntary accreditation with the Association of Zoos and Aquariums. This accreditation will provide new opportunities for donors, visitors and members through access to new programs, member benefits and, of course, new acquisitions and developments. Giggles wth excitement was the soundtrack for our day at the Zoo. My boys loved seeing the turtles munching on their breakfast of lettuce and fruit while we got our bearings before heading out. We started by heading through the Asian Realm. 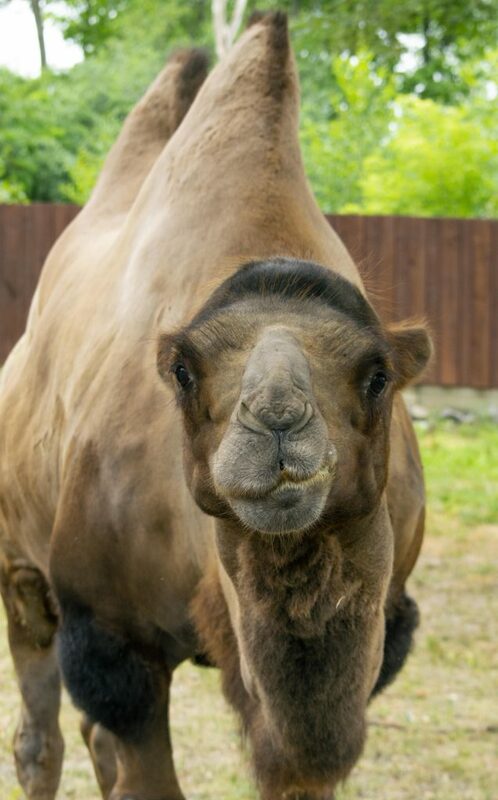 The boys loved the Chinese Alligators and the Urial, but the highlight was definitely the pair of camels that lazed in the sun on this very warm day. The calls of the Bald Eagles were awesome and a nice reminder of why these birds are our National Bird. We followed the path up a slope and were greeted by two pair of lions in a huge enclosure. 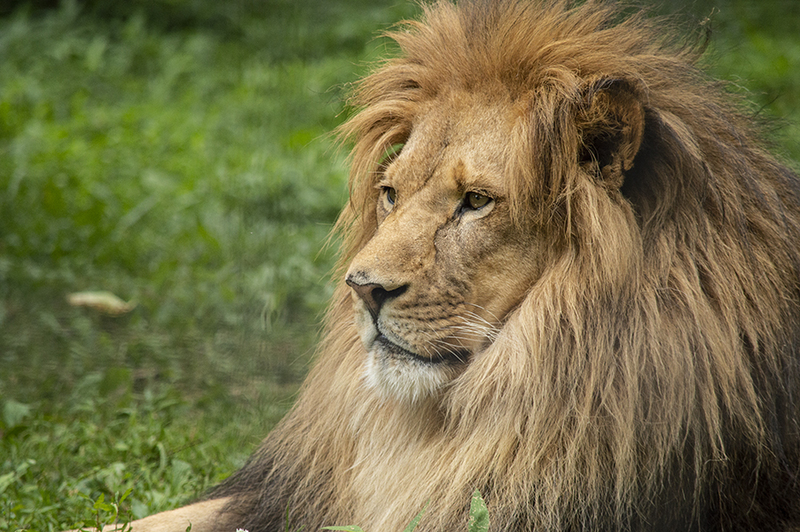 We spent a bit of time visiting with these large cats and meandered around their enclosure, getting different views. After the lions, we started on the North Trek Nature Trail. This interactive, natural trail experience is great. 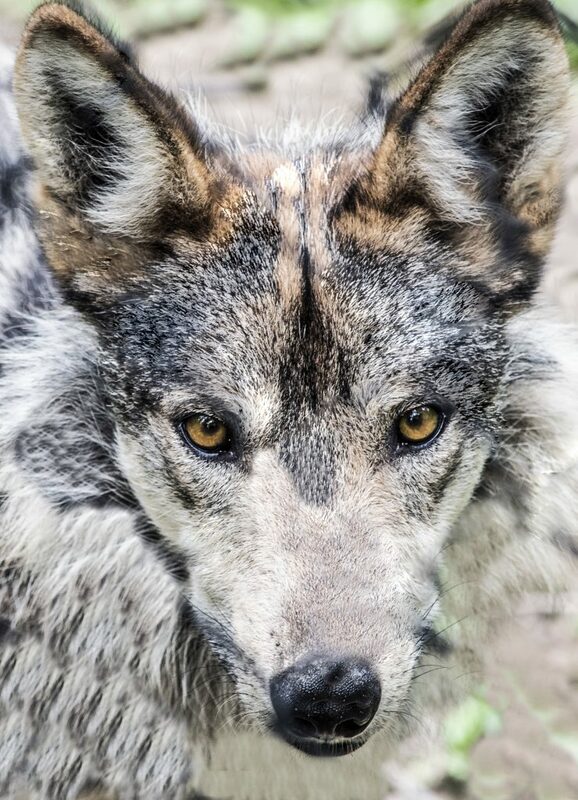 There are animal enclosures along the path featuring Mexican Wolves, Arctic Fox and Canadian Lynx. The best parts are the little experiences for children in the Nature Play Area. There is a large brush pile and display that teaches visitors what critters can be found there. There are perches, large nests and shelters so we could get the full critter experience. Benches are in most of these alcoves so parents can watch kids play and explore. Coming back down the hill, the boys saw Hyenas, Lemurs, Zebras and Ostriches. Food is available from Voss’ and we made sure to visit, eating our meal in the adjacent pavilion. Voss’, a seasonal eatery offers staples like burgers, hot dogs, fries and ice cream for a reasonable price. My family of five ate lunch for under $30. There are many well-appointed and landscaped picnic areas throughout the zoo. Feel free to bring in your own picnic lunch and enjoy – just beware that the roaming peacocks will probably stop by to join you and your family. After lunch we played on the playground for a bit before heading over to the Children’s Zoo. This eclectic collection of barnyard, Australian and wild North American animals was a nice way to end our visit. This highly walkable park is great for little legs. It isn’t too big, capping at just under 2 miles and most is navigable by a stroller. I would suggest that visitors who have trouble with hills or in wheelchairs use the turnarounds before heading into the North Trek Nature Trail. Voss’ is seasonal and is cash only. There is an ATM on site, but a homemade picnic lunch is always a great option, too. There are plenty of beverage vending machines located throughout the park. There is one set of Restrooms that is centrally located between the cranes and the Asian Realm. They are clean and well maintained. 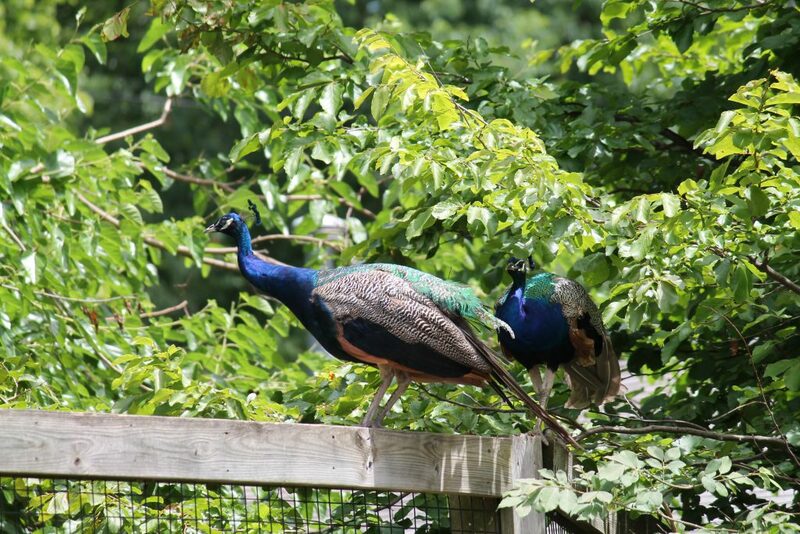 Make sure to visit before heading up to the Nature Trail or down into the Children’s Zoo. As the Zoo undergoes a lot of improvements, you should call ahead to see what exhibits will be closed or unavailable for your visit. Expect to see construction vehicles and hear the sounds of work being done. My children weren’t at all phased by this, but it was a bit of an eyesore for me. Plan your trip on a cooler day. We went in the middle of a heatwave and most animals were snoozing the day away in the shade and a bit hard to see.